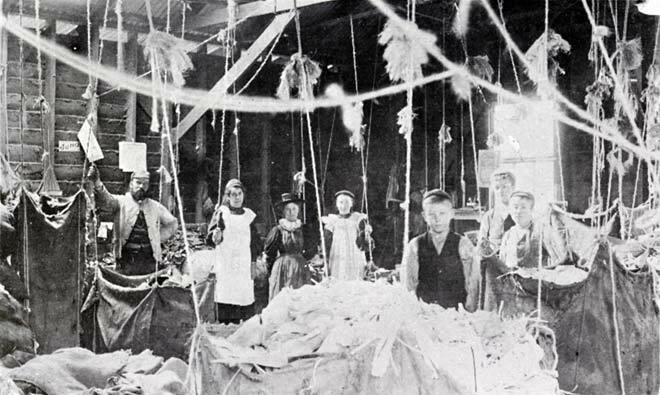 In the 19th century and early 20th century, factory workers included children and old people. The group shown here worked in the picking and sorting shed of the Mataura paper mill. Their work involved cleaning rags – which were used to make paper – of staples, pins and rubbish, and then grading them. Although the work was relatively light, the hours were long and it was cold in winter. Wage rates for girls and adult pickers and sorters are not known, but boys aged 13 to 16 working at the mill in the 1890s received 10 shillings a week ($87 in 2009 terms).